On the New York Harbor, less than 2,000 feet from the Statue of Liberty, Liberty State Park has served a vital role in the development of New Jersey's metropolitan region and the history of the nation. During the 19th and early 20th centuries the area that is now Liberty State Park was a major waterfront industrial area with an extensive freight and passenger transportation network. This network became the lifeline of New York City and the harbor area. 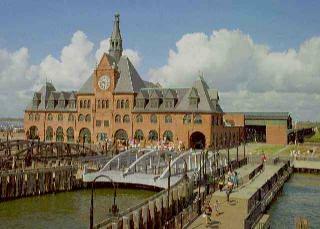 The heart of this transportation network was the Central Railroad of New Jersey Terminal (CRRNJ), located in the northern portion of the park. The CRRNJ Terminal stands with the Statue of Liberty and Ellis Island to unfold one of this nation's most dramatic stories: the immigration of northern, southern, and eastern Europeans into the United States. After being greeted by the Statue of Liberty and processed at Ellis Island, these immigrants purchased tickets and boarded trains, at the CRRNJ Terminal, that took them to their new homes throughout the United States. The Terminal served these immigrants as the gateway to the realization of their hopes and dreams of a new life in America. Today, Liberty State Park continues to serve a vital role in the New York Harbor area. As the railroads and industry declined, the land was abandoned and became a desolate dump site. With the development of Liberty State Park came a renaissance of the waterfront. Land with decaying buildings, overgrown tracks and piles of debris was transformed into a modern urban state park. The park was formerly opened on Flag Day, June 14, 1976, as New Jersey's bicentennial gift to the nation. Most of this 1,122 acre park is open space with approximately 300 acres developed for public recreation.